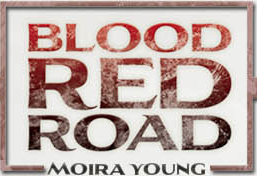 Today I'm featuring a YA book I just started reading, Blood Red Road (Dustlands, Book 1) by Canadian turned UK resident Moira Young. I wanted to feature this in lieu of the upcoming, Oct. 11, PCL Simon & Schuster panel of which Moira will be one of the contributing presences (along with Michelle Hodkin and LDS authors Becca Fitzpatrick and Elana Johnson). Blood Red Road is in the dystopian genre, or post apocalyptic, if you prefer. I pushed my way into the first page, settling in with the speech, then rode right along with its rhythm and flow. It really does grow on you and you just slide right along with it. The words set an appropriate tone for this gritty, dusty, dry story (at least, that's as far as I've gotten. I'm still in the desert Sandsea). To get more of a taste for this story (without getting sand in your mouth) watch the two videos below. The first one is creeeeepy and I'm not quite sure if the book is actually all like that (blood all drippin' everywhere and stuff). The second one has a Hunger Games feel which is how some people have described this book (to ease your hunger for more Hunger Games or your Hunger Games hangover). 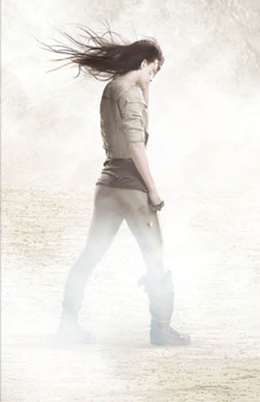 To further this point, the book's official page has these words at the top: "To escape she will have to fight. To survive she will have to lead." Check out the Blood Red Road website here. Also, here's a .pdf letter from Moira Young about the book. Aaaand, apparently Ridley Scott's (Legend, anyone?) movie company has bought the rights to make this book into a film! EDIT: Finished the book last night. AWESOME read. I really love the fact that there are no quotation marks: the story is completely from Saba's perspective and voice. There was plenty of action and such an interesting setting of post civilization. Sometimes it felt like medieval times, then the wreckage of a city would be mentioned and I'd have to sort out the setting in my mind's eye again. It was a unique blend; horses and cross bows, and hollowed out cars and tin-sheeted roofs. There was fighting and dying in the story, but nothing too graphic (my opinion -others might disagree). Saba had to fight cage matches, but there was not a lot of detail. The story moved quickly and was just plain interestin'. Looking forward to the next book in the Dustlands series.